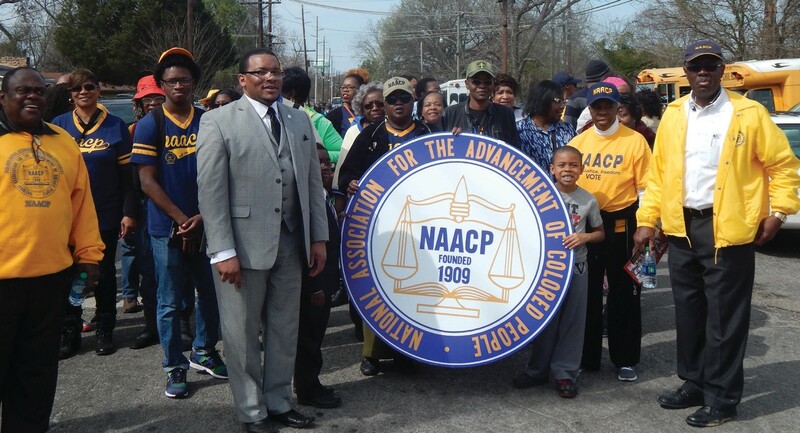 Members of the Savannah Branch of the NAACP traveled to Selma, Alabama last weekend to commemorate the 50th Anniversary of the 1965 National Voting Rights Act and “Bloody Sunday”. Departing Savannah early Saturday morning, they caravaned to Atlanta where they were joined by other Georgia Branches of the NAACP, lead by Rev. Francys Johnson, President of the Georgia State Conference of the NAACP. The trip included a stop over in Birmingham, Alabama. The group visited the 16th St. Baptist Church where on September 15,1963 a bomb exploded before Sunday morning services killing four young girls and injured many others. 16th Street Baptist Church had a predominantly black congregation and served as a meeting place for civil rights leaders. Many were outraged over the incident and the violent clash between protesters and police that followed helped draw national attention to the hard-fought, often dangerous struggle for civil rights for African Americans. The group then walked across the street to tour the Birmingham Civil Rights Institute. It is a large interpretive museum and research that depicts the struggles of the American Civil Rights Movement in the 1950s and 1960s. The Institute showcases a walking journey through the “living institution”, which displays the lessons of the past as a positive way to chart new directions for the future. The permanent exhibitions are a self-directed journey through Birmingham’s contributions to the Civil Rights Movement and human rights struggles. Multimedia exhibitions focus on the history of African-American life and the struggle for civil rights. The Oral History Project, one of the museum’s multimedia exhibits, documents Birmingham’s role in the Civil Rights Movement through the voices of movement participants. hear special remarks from Martin Luther King,III, Attorney General Eric Holder, Jr., Attorney Cornell Brooks, National President & CEO of the NAACP, Jesse Jackson, Founder/President of the Rainbow PUSH Coalition, Andrew Young and other dignitaries. Rev. Al Sharpton, Founder/President of the National Action Network delivered the message. 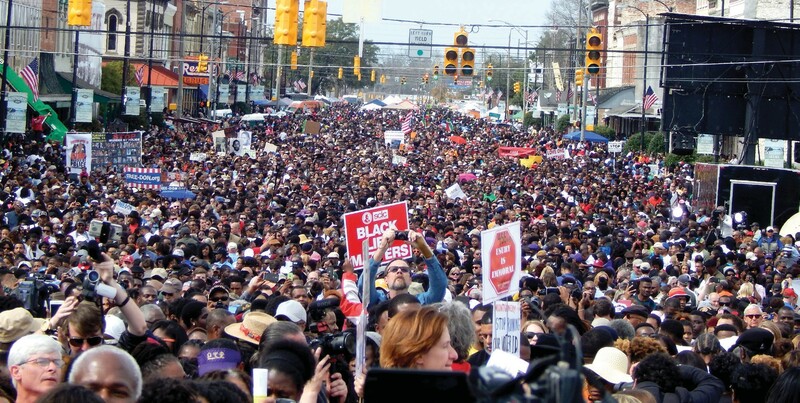 Following the services, the crowds of over 100,000 people began to march Sunday across the Edmund Pettus Bridge, the site of the “Bloody Sunday” demonstration of March 7, 1965. The brutal police assault on civil rights demonstrators that day spurred the passage of the Voting Rights Act. Carol Hunt, Executive Secretary of the Savannah Branch NAACP said “I had a gut feeling that was unexplainable. I felt that when I reached the top of the bridge, the sun was signing giving me comformation that everything would be alright. It was great to see the diversity. It showed unity and strength. I hope that the people will take that back to their communities and demonstrate the love and unity”. America needs to be reminded that Selma is more than a movie; it was a moment in the long movement for human freedom and liberty for all” said Rev. Dr. Francys Johnson, Attorney and Georgia NAACP President reflecting on the 50th Anniversary. This trip was really a pilgrimage that afforded attendees the opportunity to visit the 16th Street Baptist Church, tour the Birmingham Civil Rights Institute and Historic Selma. Further, attendees where encouraged to reflect on the tremendous progress made by ordinary citizens determined to speak up for the truth against the lie of racism and go back home to Savannah and respond the work the remains. “The Georgia NAACP is focused on finishing the work of the Movement and are fighting for good public schools, safe communities, impartial justice, and a sustainable economy is not about black or white; its about values of the red, white and blue” said Johnson. Story written by Tanya Milton who also attended the trip to Selma.